Few people are better placed to provide an insight into Southport Football Club’s Non-League history than Haydn. After more than 40 years’ involvement at Haig Avenue, his account of how the club has developed comes from a unique perspective. From being carried into the stadium as a baby and growing up as the club fought to survive, he has served as newspaper correspondent, press officer, Chief Executive and, most fundamentally, a lifetime supporter. Born in Forest Road – literally a stone’s throw from Haig Avenue – Preece has held a close association with the club for as long as he can remember. It takes only a short time in his company to realise that Southport Football Club runs deeply through his veins and as he recalls the twists and turns of the club’s history, he reels off a fascinating collection of stories and anecdotes. Preece’s burning ambition is to see the club regain the Football League status it lost in 1978 and in his current role as Chief Executive he now has the opportunity to lead Southport forward. Haig Avenue, like the club itself, has undergone significant change during his time as a supporter, and in the corporate hospitality box at the back of the Grandstand, he talks about some of his most memorable experiences, starting with how his bond with the club began. ‘My grandad was a supporter,’ he says, ‘and I remember from when I was very small being able to look over the privet hedge at the front of Forest Road when he left his bike. On a Tuesday night I would look over and see the lights. This was my Wembley and it still is. I was literally carried into the ground originally and at first I was brought in at half-time by my Auntie Winnie who lived next door. So it’s been in my blood from the start and it’s something I want to see move forward. Although he cannot remember his earliest games at Haig Avenue, the first big occasion he attended has stuck in the memory. ‘Man City was the first big game at Haig Avenue in the League Cup which was September 3 1969. The Manchester City substitute that night was Stan Bowles. We lost three nil, one of the goals was a tremendous strike by Francis Lee with a volley from the edge of the box. The other scorers were by Alan Oakes and Colin Bell. It was a fantastic atmosphere that evening and I think Man City went on to win the League Cup that season. I think they were the best team in England at the time with Joe Mercer and Malcolm Allison. So it was a creditable result, the story of Southport’s life in a way! Having finished second-bottom of the Fourth Division in 1978 Southport were elected out of League football. When the League clubs first voted, the Sandgrounders were tied with Wigan Athletic. A second ballot was called and Wigan prevailed by 29 votes to 20. It spelt disaster for Southport. Wigan had been nominated to stand for election after ending the season second in the Northern Premier League. Arthur Horrocks, the Wigan Chairman, and manager Ian McNeill had visited all First and Second Division clubs where a large number of votes lay. In contrast, Southport Chairman Walter Giller and his directors sent only a letter to those clubs. For Preece the pain of Friday June 2 1978 has never gone away. As he runs through the series of events which culminated in the end of Southport’s League status, the sense of loss remains apparent and one of his aims is to right the wrongs of the past. ‘The day we came out of the Football League is the worst day of my football supporting life,’ he recalls. ‘I was at home in Bowling Green Close when the news came through and the news actually said: ‘Good news for football in the north west.’ So that lifted my spirits until it said Wigan were in the Football League and Southport were out. The frightening thing about that was there was no reaction from the people of Southport, which showed the demise of the football club had happened well before we came out of the Football League. ‘I think our last fatal mistake was when Tom Robinson, who was Chairman here for a short period of time, reversed a League Cup fixture with Newcastle. I think there’s a lesson to be learnt there and something the supporters should take note of. John Church had been a wonderful Chairman here and we had two promotions under his Chairmanship, but he was tired and exhausted and wanted to hand this club over. Lo and behold he couldn’t find anyone, the first was Tom Robinson and the second was Walter Giller. ‘I was at a meeting as about a 16-year old when Leon Rapaport introduced Walter Giller to supporters. It was held in the boardroom area and there were a small number of supporters there. Looking back that was the beginning of the end because we finished in the bottom four and I think that because of pervious histories we were going to be doomed. Hughie Fisher did everything he could, but again without the budget. There are people at this football club who were at that meeting, mature people who should have stood up to Walter Giller and should have been a lot stronger in their stance. If we’d have had Trust members of today and the experience we’ve now got at this football club that wouldn’t have been allowed to happen. There was virtually no negative press published about this handing over or the consequences of it. ‘We’ve now got another very solid, long-serving Chairman in Charlie Clapham who runs the club on a tight ship as John Church did and he’s striving for success but within the parameters of the finances. The consequences where Robinson let the Newcastle game be switched and Walter Giller let us come out of the Football League lived on for many a year. Let’s be honest, this club should not have come out of the Football League. We didn’t finish bottom: the club did not canvass for votes appropriately and let Wigan in. One of the significant factors there was that a former director in Arthur Horrocks, an FA Councillor, had jumped ship from Southport to Wigan and that didn’t go down well with me, especially when he visited the club a lot later. As Southport sank into Non-League football, manager Hughie Fisher was replaced by Harry McNally, who made the step-up from reserve team manager. ‘The problem was that there was no way back from the Northern Premier League. Harry McNally had to start from scratch and by October he had put another fantastic side together which a lot of us believed could have competed in the Football League: Graham Barrow came from Chorley, Ron Pickering came from Leyland Motors, John Salter is someone who nobody seems to be able to get hold of, Barry Knowles; we had a very good side. McNally led Southport to a fifth-place finish in their first season in Non-League, but the club’s decision to decline the offer to become a founder member of what is now the Conference again alienated the supporters. Instead, Southport spent another 14 years competing in the Northern Premier League. ‘At the end of that season the bottom fell out of the football club again, all due to financial reasons. The Alliance, which became the Gola League and then the Conference, was formed by Jim Thompson. The idea was to set up a Non-League elite. Southport Football Club was invited as a founder member in 1979 but we did not get there until 1993. We didn’t take our place in that league because of finance and cost of transport. The problem with it at that time was there was no automatic promotion. History now shows that no club was ever elected from the Alliance into the Football League. A closed-shop emerged and we were the last club to have that vote. ‘We didn’t join that and so we were in a lower tier again and then we had a very dark period of two or three seasons. I even became disillusioned with the football club at that time; instead of seeing my heroes of the Sixties when I was growing up, I saw people who were better footballers than me but they were not up to the standard I was expecting at Southport Football Club. It was a struggle which really took until Micky Taylor came along to bring together again, so it was quite a long time. After several years of fighting to survive, Southport found stability and have since progressed under the Chairmanship of Charlie Clapham, who took to the helm in 1984. ‘You look at two catalysts which brought the club back on the map within the town: the first was Scunthorpe in the FA Cup away [in the 1986/87 season] under Brian Griffiths when we credited ourselves very well, and then of course Match of the Day and Port Vale [in 1988]. ‘Charlie Clapham came in as Chairman when the club was really at rock bottom and I think it was very hard to tell him about the glory days of the ’60s and what was achieved here and the 72/73 season when you’re ravaged with debt, your ground is crumbling and your gates are 200. And I think that more than anything, the publicity that the club received locally, regionally and nationally, led to the Chairman as well realising that this isn’t just a rope around his neck, because he was a rescue merchant at the time. It showed this club has the potential to move forward because it was a very brave decision of the Chairman to come in and inherit those type of debts. Among the club’s more recent FA Cup exploits is the memorable 2-1 away against Mansfield Town in the second round of the 1998/99 season under Paul Futcher. Having defeated a team who were going strong in Division Three, anticipation mounted ahead of a potentially lucrative third round draw. But whereas the club had hoped to be paired with one of bigger names in football, they were drawn against Leyton Orient, a team from the bottom tier of the League, who disposed of the Sandgrounders in comfortable style. Preece believes it is indicative of the fact that Southport has not been a lucky club, a belief which is rooted in history. ‘I go back to Geoff Wilde and Michael Braham’s book,’ he says, ‘and I’ve met two people who signed for Southport in the summer of ’39. They were both signed and we were really going to go for it that season with a very big and talented squad, but Hitler invaded Poland and that was the end of that. Having gone to University in Swansea and spent eight years as a teacher in Kent, Preece returned to Southport in 1990. With manager Brian Kettle in the process of assembling a competitive squad, Preece felt the club deserved greater publicity within the town and believed an ideal vehicle to achieve a more prominent place was through one of the town’s newspapers. For Preece it started a sixteen-year association with the press as one of the club’s longest-serving reporters and he continues to recognise the role of the media in generating interest. He says: ‘I was playing cricket in Ainsdale and I knew John Woods who was then sports editor of the Star, which became the Globe and then the Champion. This was at the time when Southport were certainly on the move up. I told John that I had always been interested in journalism and I wanted to move forward on that. I did a History degree and by the time I came here I had a Masters degree in Modern History as well. I had to make a decision originally whether to go into teaching or journalism; I opted for teaching. ‘So I wanted to take up the journalist’s role and I felt as I came back to the football club it wasn’t being sold was well as it could be within the town, so the two linked up well together. I talked to John and told him: ‘If you give me a press card I’m sure we can sell this football club in the town in depth.’ And that’s what we did. We competed to beat the Visiter on a Wednesday and there was no doubt that we did so, that was a competitive world with the Star and the Globe. My view is that at local level the key to reporting is working with your manager and your players. I’ve never ever had complaints from managers or players because day in day out you’re living and breathing with them. If you lose their cooperation its not link jumping ship from club to club as you would do at national and regional level. You’ve got to understand how the club works and as Press Officer and now Chief Exec I’ve tried to explain that to people who are taking those roles. ‘I would talk to Brian Kettle four or five times a week, this was before mobile phones. I would attend training sessions in the evening and make sure the players got the newspaper at training on a Thursday night so they actually saw what was being produced and that means you get a lot more back from them. ‘From the club point of view, if you look at the Visiter and the Champion, they’re going into 60 to 80 thousand homes free on a Wednesday. Now my view is of course you’ve got to be truthful and honest and the club has got to explain situations as clearly as they can. But I imagine somebody at the breakfast table on a Saturday or a Wednesday looking at the paper and saying: ‘I fancy what I’ve read, I’m going to go to the football club, I want to be part of this and engage.’ If just 1% of those people come on board you’re talking Coca-Cola League Two. And the more the club is open about what they are doing, the easier it is to do that. ‘I did that part-time with the Star, the Globe and the Champion, and I wrote the first back page of the Champion. When the Globe transferred to the Champion I was invited by Sue Kenyon, who was then the editor of the Visiter, to come on board with the Visiter. I look upon that as a real honour at that stage. There had been four main reporters: Joe Moore 1945 to 72, Ken Watkins 1973 to 78, Alan Prole 1978 to 93 and I was 1993 through to 2006. There had also been other people who wrote such as Dave Bassett, Charles Lambert and Steve Brooks. So it was a great honour to be part of that and from there I put the money I earned from the press onto the youth development. I bought shares to set up the youth development and said to the Chairman ‘I will buy shares so that if I do go over budget in the first year or so it is on my head and I have actually contributed towards it. Having consolidated their position in an increasingly competitive Conference in 2006 following promotion the previous season, the Southport board made the decision to take on a full time playing squad for the first time in 28 years. 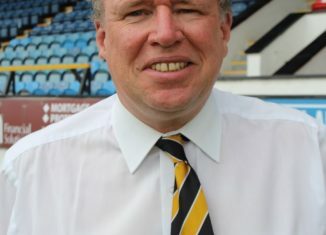 The change of status was accompanied by the creation of a new position within the club: Southport FC’s first ever Chief Executive. The role was taken by Preece, for whom working on a professional basis at Haig Avenue was the fulfilment of a lifetime ambition. ‘It came about because Derek Hitchcock had been working as sales and marketing here from just after Wembley until the club made the decision to go full-time,’ he reflects. ‘When Derek made the decision to move on, I spoke to the Chairman about the implications of full-time football and the Chief Exec role, which would embrace sales and marketing, PR, media and the day-to-day running of the football club. I had been teaching for 25 years and I couldn’t refuse. It was a massive decision, but it was one where I would have kicked myself for the rest of my life if I hadn’t taken it and the aim is to move this club forward into the Football League. ‘Since then we’ve gone one step backward, full-time football has not given us the positive we were hoping it would. If you look back learning from the HFS Loans League [Northern Premier League] and the Conference, the HFS Loans League was won by Colne Dynamoes who threw a lot of money at the league but they didn’t have a ground which was a fundamental flaw in their plan. Looking at it now our first couple of seasons in the Conference were probably the best chances to win that league. It was the elite part-time league and it had some tremendous players in it, I think of Kim Casey in particular, and we had a chance of winning it. But we were the new boys on the block and we probably didn’t realise how close we were and we were stabilising. Then Max Griggs came along with Rushden and Diamonds, who didn’t achieve their objective straight away, but he came in with the full-time concept to compete to follow suit. In the 1995/96 season Kettle was replaced by the Billy Ayre, who led Southport to a sixth place finish in the Conference, scoring 77 goals in the process. But amid a memorable campaign, Preece remembers one incident which proved to be a rare experience during his time with the press. ‘Billy Ayre brought a great deal of professionalism and Football League expertise to the club. I learnt a lot on the press side from Billy, a very rigid disciplinarian and former teacher. When you look at his record at Southport in the Conference it was absolutely superb and he taught me a lot. One of Preece’s funniest memories comes from December 1992. With a 2-1 win away at Blyth Spartans, the Sandgrounders progressed into the second round of the FA Cup for the first time since 1968. Brian Kettle’s team had already played six matches in the competition that season and were on course from promotion from the Northern Premier League. ‘Blyth Spartans was our first overnighter,’ Preece remembers, ‘and the Chairman at Blyth had told us he would get our accommodation booked. He did, but we arrived to find that it was over a nightclub. So trying to keep a curfew on the players was difficult and there was a lot of noise! It was something brand new to them all, so it was a bit of a jaunt which was not the way the professional overnighters should be. We learnt a lot from that and the Chairman learnt a lot as well, he’s never got a booking from another Chairman again! ‘So we went to Blyth Spartans which was a very hostile atmosphere that afternoon. Paul Moore managed to dive over the ball early on but we came back into the game really well and Paul had a great game. Jack Carr had booked an evening meal at Kirkby Lonsdale which we were all looking forward to. Unfortunately, on the way home there was a major accident at Scotch Corner and we were worried because our supporters had travelled ahead. What we should have done was wait and we would have eventually crawled through Scotch Corner and got home because the supporters managed to do that. But our coach driver decided to take a detour which took us down country lane after country lane. It began to snow and eventually the snow became thick. We got our coach over a bridge and then stuck. I always remember a bungalow on the right hand side and we couldn’t get the coach out, it was very difficult to turn it around. With the prospect of appearing at Wembley drawing close in March 1998, Southport were drawn away in the FA Trophy quarter-final against Grantham Town. With the Lincolnshire team going strong in the Southern League Midland Division league, it was a potential banana skin. Brian Butler, the Port captain, was the driving force of Paul Futcher’s side and an inspiration behind the Trophy, but this was a match in which they almost had to manage without him. ‘We had stayed for a pre-match at a country club, so we set off and when we arrived at Grantham there was a large gate and people were queuing outside. We got into the ground, Paul Futcher took his players for a walk around on the pitch and went back into the dressing room to deliver his introductory team speech. He mentioned Brian Butler and everyone looked around. Brian Butler wasn’t there because he was admiring the 18th green and somebody putting on that when the coach left. He’d seen the coach set off 250 to 300 yards away and couldn’t get anywhere near it. So he grabbed a taxi and it was a 20 minute drive. He arrived at the ground, he wasn’t in kit or a tracksuit, he fought through the crowd and explained to the gateman that he was the team captain of Southport. The gateman said ‘everybody says that’ and he wouldn’t let him in! We agreed that would not be published unless we won and after winning the replay it was published. Preece’s time as the club’s correspondent for the Southport Visiter spanned the reign of several managers and as he reflects on a number of memories, he insists that special mention is made of Paul Futcher, who led Southport to Wembley in 1998. ‘He was absolutely magnificent,’ Preece says. ‘If I won the lottery tomorrow I would bring him in some capacity. He exudes class and the only reason he didn’t play for England was that he was involved in a very serious car accident and was out for quite a long time. ‘Going back to looking over that white wall, I always remember reading a copy of the Football League Review in the programme before a match and there was Futch and Ron Futcher as youngsters at Chester City. He was a real gentleman, a wonderful coach. Futch is one of those people who was so talented and technically so good that he did expect other people to play to those standards, but the further you drop from the standards you’ve played the harder it is. I don’t think he sells his talents as much as he could do. I felt that because he was relaxed when he didn’t play towards the end supporters didn’t recognise what he was thinking. He was quality on the pitch and to go to Wembley at the age of 41 was remarkable. ‘Looking back, he brought in Phil Bolland, Scott Guyett, Tim Ryan, Lee Elam. I think Mark Wright [who succeeded Futcher] and Paul Futcher together are a Championship management team: Mark is your motivator, you are never going to escape without giving 110%, but Futch could identify players and was such a high quality coach. Futch could also deal with experienced players such as Mark Stuart and at the time I don’t think supporters recognised what we had. ‘Mansfield in the FA Cup was the only time Futch didn’t play centre-half for Southport. He started at centre-half and Billy Stewart had one of those remarkable games where we could have been for or five down. Brian Butler sustained an injury and Futch, who could play in midfield and had done during his career, rolled his sleeves up and just made it talk; it was magical. Mansfield were flying high at that time. The next season we didn’t quite exploit or build on what he had brought in and that was up to him, possibly he needed to be stronger with the Chairman at that stage to bring in more firepower which is what we lacked. But there was still only one promotion place, the play-offs weren’t there. Now if we’d have got that finance from Wembley the Chairman would have released it but there was no way we could have moved up, we weren’t really going to win that league with the likes of Rushden and Yeovil as the big hitters. The following day the Southport team were afforded a heroes return as the people of the town took to the streets to show their appreciation as the players paraded in an open top bus before attending a civic reception. Although Southport had lost, the post-match celebrations meant some members of the travelling party were more than bleary-eyed as they returned home. ‘Max Thompson was our health and fitness physio, he was a former Liverpool physio as well. The Chairman put on a fantastic post-match banquet win or lose for the party who had achieved so much and I think we celebrated a lot more than Cheltenham. We recognised the achievement of being at Wembley, albeit that everybody wanted to win. ‘On the way back from Wembley Max’s breakfast was mainly liquid. If you look at the photos of the open top bus tour around the town Max was hanging off the front of the bus after his indulgences – that was our health and fitness co-ordinator. Then we went to meet the Mayor at the Floral Hall at the civic banquet. I got a whisper in my ear from the Chairman saying ‘get him out of here’ and I looked to see Max Thompson talking after inhaling helium for the third time like a Disney character to the Sefton official. Max had enjoyed himself tremendously and he had done so much work over the period of time to make sure everyone was fit and healthy. Max was a great character, a real team man and you look at what he had achieved, he is the youngest player to play for Liverpool in a first-team fixture. Futcher was replaced in December 1999 by Wright, the former Liverpool and England international defender, for whom it was a first managerial post. Despite inheriting a team sitting near the foot of the Conference table he guided Southport to a fourth place finish the following season – the club’s joint-second highest finish since 1978. Wright’s illustrious career ensured he was a forceful personality, but Preece remembers there were plenty of memorable moments. ‘Mark Wright was brilliant to work with, he was absolutely superb,’ he reflects. ‘The Visiter had got an arrangement with the Chairman that we would get the release and it was announced on the Wednesday evening. One of the statements he made was that he was very pleased to be involved with amateur football, which was cringeworthy. I had to dash away after the press meeting in the evening because I had a parents’ evening. I remember phoning the Chairman at midnight and saying ‘you have got a monster on your hands there,’ because he was a very strong character. But from a press point of view and on the day-to-day basis he was brilliant to work with. ‘I think the Chairman was looking for something big at the time, I think he was trying to take the club a stage further. It was a shame that Mark Wright’s appointment came at the wrong time; it came just before the introduction of the play-offs and unfortunately Mark had left by the time the play-offs came in. ‘Mark was great company, some of the stories with Mark and Ted McMinn [his assistant] were fantastic. One of them was about goalkeeper John Burridge, who used to prepare for matches by catching cushions as his wife threw them. He used to turn up at England games with his kit just in case the goalkeeper couldn’t play. The players were in a hotel practising with the cushions and Burridge dived full length and took the chandelier out! The last manager Preece worked with in his role as a reporter was Liam Watson, who arrived in October 2003. Having taken over a club in decline following the trauma of relegation, Watson conducted a remarkable rebuilding exercise, culminating in the promotion of 2005. On top of leading Southport back into the Conference, it was his honesty and character that distinguished Watson as a true fans’ favourite. His openness with supporters was highlighted during the struggles of the 2005/2006 season which followed promotion. Despite a humiliating series of results he remarkably retained the faith of the fans and improbably led the Sandgrounders to survival in extraordinary style. ‘I first met Liam in the corridor here when he was managing Runcorn,’ Preece recalls. ‘I was talking to him about Adam Carden who was one of our ex PASE lads who was with him. We struck up a relationship and we got on well, so when the Southport job came up Liam contacted me and we had several phone calls for several hours. So much so that when he got the job the Chairman on the touchline before the game shouted ‘there’s your agent’ to Liam pointing at me. I ran through the whole football club with him and where it was. You can actually see the cycles and we’ve got to get out of those cycles because we do need continuity. ‘The belief of the players with Liam saw us through in our first season back in the Conference, there was that togetherness. You only have to think back to the five nil defeat at Exeter, four nil down at half-time and applauded off at full-time. On the Friday night I was with Liam in the hotel and he was telling me what he was going to do: three up front and he was going to take Exeter on. He had looked at particular games and had pin-pointed where we were going to get the three points so this was a bonus match. ‘Our supporters had a difficult journey on the Saturday and got there through snow. The Exeter supporters could not believe that our crowd applauded the Southport players off at half-time and again at full-time, they thought it was mad. Liam Watson decided to keep the players back and we didn’t set off until about seven o’clock that evening. We stayed and had some drinks and some food, we got everybody back together again. It was one of Gary Brabin’s first matches and he’ll tell you that he thought ‘what have I let myself in for here?’ And it is only now that Gary recognises he wasn’t really part of that squad at that time. Towards the end of the 2005/2006 season came the announcement that avoiding relegation would see Southport turn full-time the following campaign, a decision which brought to an end Watson’s tenure. His departure in the summer of 2006 prompted a passionate reaction from the fans and the circumstances surrounding the way he left have been the subject of much speculation. Preece says: ‘I talked to Liam a lot in that first season back in the Conference about a part-time/full-time type model and then it was announced that if we stayed up we would go full-time. That was to promote the club, show the club’s ambition and get the public on board. Liam possibly needed to discuss the part-time/full-time model more than the full-time model on its own because I think the blend had to be there. ‘Just before the shareholders’ meeting Liam had meetings with Charlie and he was looking at how he could manage his career and the football side of it. I think Liam should have stuck. The Chairman doesn’t usually make quick decisions and I said to him that it was an amazingly quick decision to sign Gary Brabin [the club’s first full-time signing] on the pitch at the supporters’ Trust match the day after the season had ended. It was a real statement of intent from the Chairman: this is the model, this is manager and this is the coach, we’re going to work together. You talk to Gary Brabin and he had a number of contacts for the Conference and players to come in. Something fractured and went wrong just after that, Liam decided this wasn’t the way to go. It was Liam’s decision and Liam will tell you it was his decision. Liam was having to negotiate a budget to bring a squad together because he had stuck with his players, he’d been very loyal to that squad of players, and that loyalty had actually got him out of the problems. Succeeding Watson promised to be an invidious task and after a prolonged search the task went to Paul Cook, an experienced player and a coach with Conference champions Accrington Stanley, but someone without the experience of front-line management. Preece’s appointment as Chief Executive coincided with the wholesale change which accompanied the transformation to full-time, but working with Cook lasted only six months. With prevailing disenchantment on the terraces and the club marooned at bottom of the Conference, defeat on New Year’s Day at Northwich Victoria spelt the end for Cook after managing just four wins from 25 matches. His replacement was Peter Davenport, the former Nottingham Forest and Manchester United striker who had also played for Southport, and although he oversaw a valiant end-of-season revival, relegation was not prevented. ‘I think Paul Cook was very unfortunate and I think he will make a very good manager, he had unfortunate experiences here and I won’t criticise him. Peter came in and he almost saved us but didn’t quite make it. Davenport managed Southport for 15 months. Although his team were within two points of a play-off place when he was sacked a month before the end of the 2007/2008 campaign, results had deteriorated and disquiet around the club increased. Preece had enjoyed a close working relationship with the former England striker, but it ended on a sour note after Davenport claimed he had been ‘stabbed in the back.’ ‘We’ve talked about loyalty with the press and managers,’ Preece reflects, ‘and my relationship with Peter Davenport was very, very close on a day-to-day basis, as it was with Paul Cook. My view has always been that this club needs continuity with its managers. Unfortunately Peter feels the relationship fragmented with his departure. We hadn’t won a home game since Boxing Day, gates had slipped, there wasn’t a feel-good factor and the defeat on Grand National Day at Solihull was last straw. There was also the fact that players were openly talking to supporters with unrest.